SNOWFALL AT LUTON and Stansted airports in London have been causing delays for travellers today. Both airport runways were closed earlier, however they both reopened at around 8.15am. Stansted Airport has since tweeted that snow clearance and de-icing are underway, and though there are some residual delays, operations are getting back to normal. Luton Airport said that it is open and operational, but passengers are advised to check the status of their flight with the airline before travelling. The snowfall has meant some disruptions to air passengers at Dublin Airport but a Dublin Airport Authority Spokesperson told TheJournal.ie they are “minor”. Ryanair flight 202 took off from Dublin this morning to Stansted but it was forced to return because the airport was closed earlier. Two Ryanair flights to London have also been cancelled. 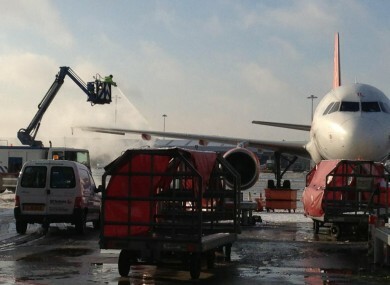 Wintry conditions meant there were also some delays for an Aer Lingus flight to Stockholm this morning. Passengers are being advised to check with their airlines before travelling. Email “Stansted Airport “getting back to normal””. Feedback on “Stansted Airport “getting back to normal””.